I had Rhapsody now known as Napster for a couple of yrs. but just cancelled it. Not happy with it anymore. They can't resolve technical issues and keeps popping up. An example am on my data not wifi and want to download and says not connected when in fact I am. I have heard good about Spotify. I'm on a free trial with Tidal. I like it a lot. It's a bit more expensive than Spotify, but is well laid out and looks nice. Great features. I recommend and use Google Play music. It works great and you get YouTube Red at no extra cost. I watch a lot of YouTube so not having to watch the ads is pretty awesome. Google Play Music..I love it just wish it worked with the Watch..
We have a family subscription for Apple Music and it works great. I still have not cancelled my Google music either. I like having YouTube Red so just have not given it up. Both are excellent and I'd be happy with either if I had to pick. Tidal has a cheaper option if you don't sign up for the HiFi streaming option. 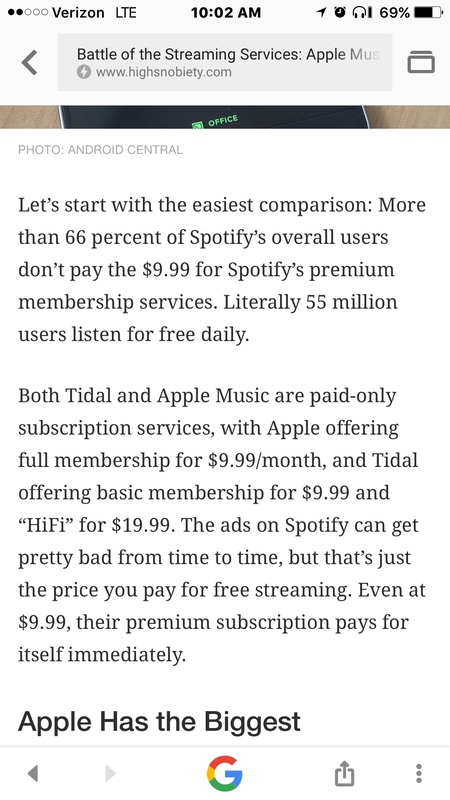 The lower option is more comparable to Spotify, if I'm not mistaken. I believe they are both $9.99. I've got Tidal and Apple Music. Spotify is great as well. You really can't go wrong honestly. They are all comparitively priced. It's all about which layout you prefer. Tidal leaves a bit to be desired in terms of the layout. Apple Music offers great integration with our devices. Spotify, imo, has the most pleasing layout simply because they've had a lot of time to perfect their service. I'd argue they are the best out (Despite the fact that I don't subscribe). I went with Tidal for the HiFi streaming quality and Apple Music for the integration. I actually did research on this exact question to myself. For me Spotify (paid version) was the best for sound quality. According to my ears and Google anyway...LOL. Tidal wanted a higher price tag for quality sound. Apple Music is great for integration between devices and music stored from other means besides iTunes. It's really a matter of preference to be honest. I decided to go with Spotify. Last edited by Spencerdl; 04-03-2017 at 09:03 AM. Apple Music. Mostly because it's fully-integrated with iOS. Not Quite Right, TheRandomDealio and Tartarus like this. I think if you are good by listening novelties you can use Soundcloud, it have the option to save some of the songs, has a lot of music and it's freemium. I also use Google Play. It is because of the ad free YouTube Red. Well worth the $15 a month family plan. I have all my music on iTunes, and also on google play. Around 30GB of music. With unlimited data, I can choose to stream or listen to the music on my phone. No way will I pay $10 a month to stream music. I love and recommend Spotify. But I mainly use Amazon Music now, because it is included with my Amazon Prime membership. I've tried Google Play for a while but didn't like it. I tried the free version of Spotify but as well as the black interface as the limitations of the free version were a deal breaker for me. I have to say I'm quite happy with how Music works. Jude526 and TheRandomDealio like this. This is what I have, Apple music and YouTube Red. That Red sub also included Google Music although I don't use it. I love Apple music. cwbcpa and Jude526 like this. DarlaMack and Jude526 like this. I'm just curious, are you against paying for streaming because you don't own the music or is it something else? What I gather is that he uses Google Play to stream his purchased music. He doesn't feel much for paying for songs on a streaming service. Thank you. Yeah I understood that much from what was said. I was just curious if he was someone that preferred to buy all of his music as opposed to basically paying a monthly fee to listen to as much as you want. I think it's interesting how music distribution has changed. So if someone is still buying a CD and uploading it to Google Play or iTunes I think that is interesting and also rare. I wasn't criticizing anyone. I was just interested in a different perspective if that was the case. I understand. I, personally, have my previously purchased songs uploaded (and matched) to Music. And still, if I like a song very much, I choose to purchase it from iTunes. Just in case on a day I decide that I don't want to pay for streaming services anymore, I will still have those songs in my library. cwbcpa, Spencerdl and joemd60 like this. Can you add photos to memories?